Do you know someone who is interested in completing an electrical trade qualification in regional NSW? Essential Energy is committed to providing exciting and challenging career opportunities across regional New South Wales. We work to give men and women the skills and training they need to establish a foundation for rewarding employment and career development in the communities in which they live and work, and in which we operate. Advertising for our 2018 Apprentice has opened, and applications close 12pm (AEST) Friday, 8 September 2017. Dorrigo, Taree, Tweed Heads, Kyogle, Balranald, Deniliquin, Goulburn, Bombala, Queanbeyan, Yass, West Wyalong, Barraba, Tamworth, Bourke or Walgett, Narrabri, Dubbo, Goondiwindi, Inverell, Oberon and Warren. Orange, Dubbo, Albury, Queanbeyan, Leeton, Tamworth, Port Macquarie and Lismore. During the four-year Apprenticeship program, successful Powerline Worker applicants will study towards obtaining a Certificate III in Electrical Supply Industry – Distribution (Powerline), while Electrical Technician applicants will study towards obtaining a Certificate III in Electrotechnology – Electrician. Both trades will work as part of their technical trade crew, completing invaluable on-the-job training while learning and growing from the wealth of knowledge and experience surrounding them. Essential Energy’s Apprenticeship Program provides exposure to a diverse range of opportunities, working on an electricity network that covers 95% of regional NSW and parts of southern Queensland. This is an opportunity like no other, to work on a complex network, with a team of highly skilled electrical tradespeople, who are passionate about ‘keeping the lights on’ in their local communities. Successful applicants need a strong grasp and proven results in Maths, Science, and English. 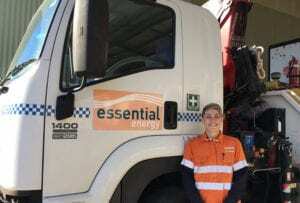 Other requirements include; a current drivers licence (full/provisional licence is preferred), a willingness to live, travel and work in a variety of regional NSW locations throughout the duration of the apprenticeship, being a team player and being comfortable working at heights. Essential Energy is committed to building a culturally diverse and inclusive workplace and strongly encourages applicants to apply regardless of gender, age, sexual orientation or disability. As an organisation, our aim is to champion inclusivity in the workplace and celebrate the difference in all our employees.